Updates on each tracked shark are below, followed by the original story about Expedition Nova Scotia. Track all satellite-tagged sharks at ocearch.org. “Nova,” an adult male named for Nova Scotia and measuring just over 11 feet long, was tagged Sept. 24. He is the first white shark ever fitted with a SPOT tag in Canadian waters. A SPOT tag is a type of satellite tag that sends precise geographic location data to scientists in near-real time, when the shark’s dorsal fin surfaces. Nova was also fitted with a pop-up archival tag that will collect detailed data on his swimming depth, temperature and general location for up to one year, and then will disconnect from the shark and float to the surface, relaying its data to Hueter via satellite. This double-tagging method maximizes the information learned from Nova and also helps test the location-tracking capabilities of the pop-up vs. the SPOT tags. On Dec. 6, Nova’s tag pinged near Marathon, Florida. In 103 days, he has traveled 1,730 miles. 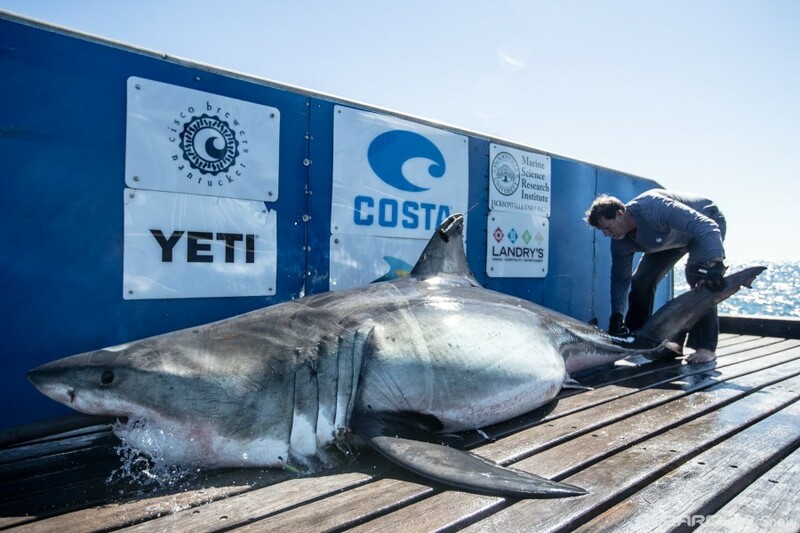 “Jefferson,” an adult male named for OCEARCH corporate sponsor Jefferson’s Bourbon, measuring 12 feet 7.5 inches long, was SPOT-tagged also on Sept. 24. On Dec. 1, Jefferson’s tag pinged just south of the Florida-Georgia border. He has traveled 1,204 miles in 103 days. “Hal,” an adult male named for the people of Halifax, measuring 12 feet 9.5 inches long, was SPOT-tagged Sept. 29. On Nov. 24, Hal’s tag pinged near the border of North Carolina and South Carolina. He has traveled 1,128 miles over 103 days. One immature, “subadult” male white shark was nicknamed “Shorty” because he was “only” about 10-and-a-half feet long. He was sampled and released on Sept. 30, without a SPOT tag because Canadian authorities had placed a size limit on sharks to be tagged. That rule was subsequently rescinded during the expedition. “Cabot,” a 9-foot-long subadult male, was SPOT-tagged on Oct. 5. On Dec. 9, Cabot’s tag pinged east of Charleston, South Carolina. In 103 days, he has traveled 1,705 miles! “Jane,” a 10-foot-long, subadult female, was SPOT-tagged Oct. 8. Jane was also fitted with a pop-up tracking tag that will collect detailed data on her depth, water temperature, and general location over the next year. As the first female caught in the expedition, Jane was double-tagged for the same reasons as Nova. On Nov. 20, Jane’s tag pinged south of Chincoteague Island, due east of Richmond Virginia. In 103 days, she has traveled 778 miles. “Luna,” a whopping adult female longer than 15 feet, was SPOT-tagged on Oct. 8 and was the largest shark tagged during the expedition. Based on her total length and girth, researchers estimate her weight approaches 2,000 pounds. On Dec. 12, Luna’s tag pinged relatively far offshore of North Carolina. In the past 103 days, she has traveled 2,037 miles! Seven great white sharks were caught, sampled, measured and released — six with location-tracking satellite tags — during OCEARCH’s Expedition Nova Scotia, which took place Sept. 18-Oct. 12 with on-board Expedition Chief Scientist Dr. Bob Hueter, Senior Scientist at Mote Marine Laboratory and Chief Science Advisor for OCEARCH. The team discovered an exciting concentration of white sharks south of Lunenburg, enabling multiple innovative studies to progress. This expedition was the latest in a series of multi-institutional efforts to study white sharks aboard the M/V OCEARCH in the Northwest Atlantic Ocean, begun in 2012. Expedition partners tag, track and collect samples from the North Atlantic white shark population to learn important life-history details needed for management and conservation, including where these sharks migrate, mate and give birth. Expedition Nova Scotia supported 15 projects by 26 scientists at 19 institutions, including studies of: the sharks’ movements in the Atlantic Ocean; the influence of ocean processes on their distribution and population dynamics; white shark diet, health, reproductive processes, stress physiology and the microscopic organisms the sharks carry; and the impacts of microplastics and certain pollutants on white sharks. Read the detailed science brief here. The expedition sought to investigate whether white sharks mate off Nova Scotia. The current expedition neither confirmed nor ruled out mating. All told, expedition partners sampled and released five male and two female white sharks, fitting four of the males and both females with satellite-transmitter tags and fitting all with acoustic tags that can be detected by underwater receivers used by various scientists in multiple areas down the North American Atlantic coast and in the Caribbean. By Oct. 16, all the SPOT tags have been heard from except for Jane’s. Jane was in extremely good condition with low indicators of stress levels in her blood when released, so she is likely just surfacing less than the others, which some sharks tend to do. Jefferson has moved the farthest of the five sharks reporting so far, to waters south of Massachusetts and more than 350 miles from his tagging site.